The butterfly is a beautiful insect that symbolizes new birth unless it’s in your stomach! “I have butterflies in my stomach,” means I am anxious about something. The event could be something small or big. When I face a new situation, like starting to help a new student with his college essay, I get excited. Excitement is good and positive. Hans Seyle, the father of stress research, named positive stress, Eustress. But excitement can shift into anxiety, or stress, if one doesn’t prepare for the new situation. Preparation is the key difference between feeling excited with anticipation and feeling anxiety and dread. Taking steps to prepare for a new school year during the summer can ease the anxious feelings for both students and their parents. Activities like buying school supplies, completing summer reading assignments, or meeting one’s freshman college roommate via Skype before you move in together are ways to ease the transition. The goal is to turn anxiety into beautiful butterflies of excitement. On the other hand, avoiding steps to prepare for change increases stress and escalates fear of the unknown. Starting now, before school starts to take steps toward change, before the change occurs, will result in a more confident and happier student. This summer I attended a wedding in Chautauqua, NY, which is close to Niagara Falls so I drove the short drive to the famous falls. As I watched the water cascade into the wondrous spectacle, I wondered about the tiny water molecules as they approached the 100-foot drop. “Wow,” I thought how must it feel to be a water molecule, oblivious to the upcoming, 10-foot drop onto rocks and dangerous whirlpools. People who prepare for upcoming changes can relax and enjoy the beauty of change, but those who do not are caught off-guard, feel anxious and their journey can end in disaster. 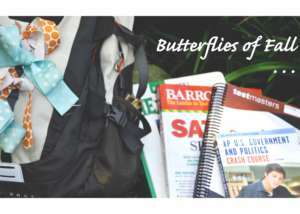 At Bright Futures we capture the butterflies of anxiety by helping students and families prepare for college, which relieves the stress that can accompany this competitive, multi-step process. We like butterflies to remain beautiful creatures of nature.